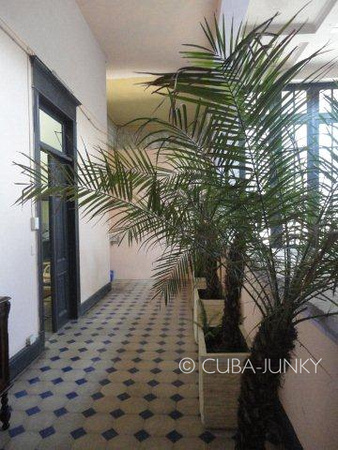 Prestigious apartment for rent in Old Havana, Cuba. 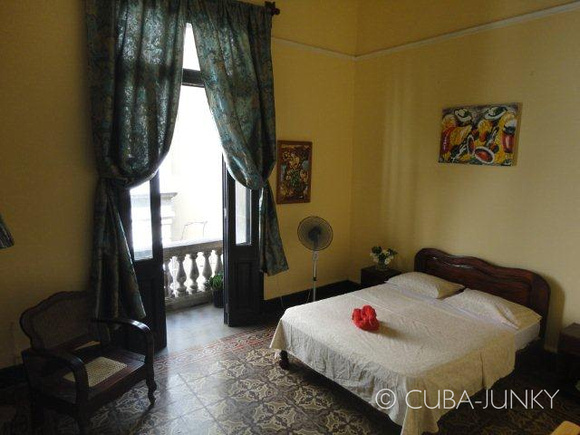 Walking distance to Old Square, main street Obispo, Malecon, Artist center, Capitolio, Park Central and Floridita restaurant. This casa particular has been restored to provide accommodation for a family or group of five houseguest. It has a large living room area for living, with high ceilings and antique floor tiles. There is also a standard kitchen and two balconies that overlooks Obra Pia street below. The apartment has a terrace with palm trees and exotic tropical plants where the guests can dine. Meals are optional, e.g. standard continental breakfast comes with fresh organic fruits, freshly squeeze juice, toast, coffee, etc. Special meals such as vegetarian cuisine, local delights, fine dining are also available upon request. Transportation can also be arranged for pickup from the airport and for any local excursions. We enjoyed our stay at Arturo's place. He is a very friendly host. His recommendations for our Cuba trip were very useful. He helped us for example organizing the transfer and accommodation in Viñales. The breakfast with fresh juice, coconut pancakes, fruits & coffee prepared by Raquel was also very delicious. How was your room? :	Our room was very huge and comfy. How was the food they offer? :	The food -we had breakfast- was very delicious. Very spacious large room, high ceilings, double balconies, facing the street. It was a fantastic location. The building is historic stock exchange in previous years. The room is very clean and comfortable. The whole apartment is very charming with a lot of history. The host is awesome and very friendly. Breakfast is served with organic fruits, eggs and freshly squeezed juice. Breakfast can be customized to one's liking. Bathroom is very clean and ample water pressure. I feel very comfortable and safe and best of all, the host speaks English and other languages. He could be an interpreter. I would definitely go back again and I would definitely recommend all my friends from USA to stay there. How was your room? :	Very clean and comfortable. It was large with high ceiling. There are 2 balconies facing the street. It was quiet during my stay. How was the food they offer? :	I eat mostly organic food. So breakfast was great with organic fruits, eggs and freshly squeezed juice. The portion was big and satisfying. Not to mention the Cuban coffee served... hmm hmm hmm..
Other services they offer:	The host is also an adviser for other excursions, cultural sights or venues in the city that's happening..!!! He can also recommend one-on-one salsa dancing lesson with local instructors, for those who are interested, right in his spacious living room. He also does cigar tours himself and fly-fishing recommendation. Other comments:	The restaurants that he recommended was close to the house. They offer delicious, reasonably priced local cuisine with excellent cocktails.